A big part of what we advocate for Origina is the promotion of choice by campaigning against lock-in practices that dominate the software industry. This alone makes us stand out. We believe in choice, right of ownership, and to freely choose your provider to trade, maintain and repair. Origina’s CEO and founder, Tomás O’Leary is involved in http://www.repair.org and was one of the founding members of www.free-ict-europe.eu. The main objective of these non-profits is to secure these rights to repair any part of your business. That’s why the ICT law is critical and allows businesses the right to maintain and repair any hardware or software products they have bought. We believe in the choice of your service provider as it allows yourself to avoid the unwanted forced upgrades and the lengthy and costly vendor contracts. We at Origina are IBM software support experts, however we also advise what third-party option is best for you. Origina offers extensive knowledge of IBM products with our expanding community of former IBM technical subject matter experts (SME). We also allocate a dedicated IBM SME for each client which receives 24x7, 365 product expert support. For each IBM software product migrated to Origina, a team of dedicated SME’ with expertise only in that product are assigned for that term of the support. This allows us to inform, predict and control your software landscape. Offering maintenance and support to over 800 IBM products. SAY GOODBYE TO FORCED UPGRADES. Origina offers designated extended support for customers who are running an unsupported IBM software product, that is under requirement to upgrade to the newest version. We support your IBM software at its current version without requiring our customers to upgrade.This is critical for companies that are planning to migrate their software in the future. Origina guarantees an average of 60% savings per client. Each year with IBM, your software support and maintenance costs increase by 10%. Each year with Origina, your software support and maintenance costs decrease by 7.5%. 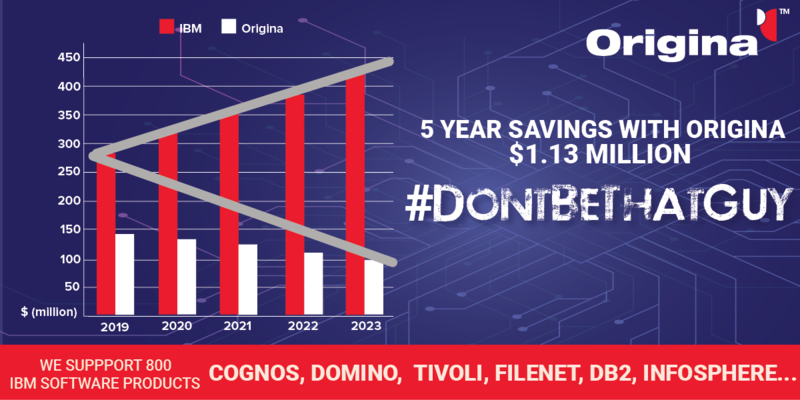 Over a five-year period, these annual decrease rates with Origina has the potential to save your company millions. Third-party maintenance services provide a cost-effective alternative, offering an improved level of service and support. As part of the first step to Origina, we offer a free-of-charge Feasibility Assessment. This tool is highly accurate and acts as a guide analysis for us to see what versions and products you have. This enables us to see exactly how much you can save by switching your IBM support to Origina. It also allows us to check the expiry of your supported products and offer flexible contracts. This is critical if your company is planning on phasing out legacy software, as IBM can attempt to tie you into length contracts for software you could be planning to phase out in a year or so. With this tool,using your software ‘E’ part numbers we are able to determine down to the cent of how much you will save by switching your support to Origina. This tool basically acts like companies like CoCompare, which allows you to receive a comparison quote. Every few months you will receive a new user agreement, it is nearly impossible for you to keep track of the user agreement applied to your current IBM software employed. Our product support database tool Eolas, automatically will put this information in for you. This helps you to understand your entitlements, and exactly how they are best applied to your future projects.This helps to extend the lifespan of your software assets, so we can also reduce disruption to operations, and your running costs.